In November 1953, teen girl magazine Seventeen offered readers an outer-space-themed issue that featured an article ("It Could Happen Tomorrow") by actor Richard Carlson, who appeared in that year's It Came From Outer Space. Carlson noted that women might be the first humans in space, because "the female of the species takes up less space, uses less oxygen, needs less food." She was also better accustomed to drudgery-perhaps due to all that housework. And that pesky body fat was a bonus! Women wouldn't become so bored or so restless as men, and that's one of the problems of space flight-the long, lonely hours, with nothing but stars and blackness all around. And women have an extra layer of tissue under their skin-they could stand temperature changes better than men. So maybe you girls who have been aiming at becoming airline hostesses will want to raise your sights into space itself. Because it could happen tomorrow. Meanwhile, Seventeen was ready with beauty tips for the not-so-far future of twenty years hence-when the popular "head in a jar" look did away with body image issues altogether. WILL THIS BE FOR 1973? 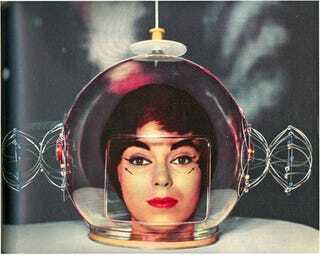 As an interplanetary tourist, you may use such cosmic cosmetics as Trans-Pact pressed powder, Semi-Stain lip and cheek color to overcome interplanetary pallor, Anti-Gravity hair control, Eye Fringe mascara, impervious to upper stratosphere moisture, Milky Way cleanser. All in plastic, in a kit touched with neon for making-up during dark spaces on the trip. . . . Headgear, a space helmet with painted eyebrows. Travel guide . . . SEVENTEEN's Lunar Look issue, November 1973. Silly, yes, but Seventeen also enthusiastically reviewed four science fiction books that month (including Arthur C. Clarke's Childhood's End: "you won't sleep until you have finished it! "), introducing its readership to a genre not always associated with young women.